This is the latest version programming box that has the built in voltage checker. 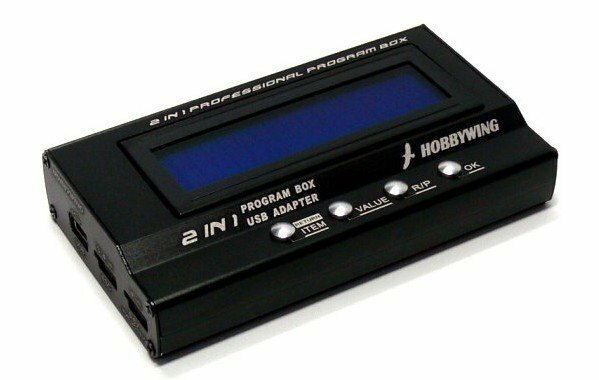 This Advanced Program Box is used to set the programmable parameters of brushless ESC, it has a 16*2 characters LCD (Liquid Crystal Display) to get a friendly user interface, so you can set the programmable parameters very easily. It is pocket-sized, so you can bring it to the racing or flying field conveniently. 1.1 Working as an individual device to set the ESC, the value of each parameter is displayed on its own LCD. 1.2 Working as an USB adapter to link the ESC with a PC, and the user can update the firmware of the ESC or set the ESC by the special application software on PC. Please click the following hyperlink to download the Application Software.